Dodgy At Best: Will Emirates Stadium Affect Arsenal's On The Field Play? Will Emirates Stadium Affect Arsenal's On The Field Play? 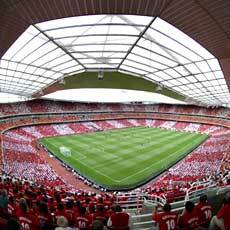 Saturday is the opening match of the EPL season and Arsenal's first competitive match at their shiny new 60,000 seat Emirates Stadium. 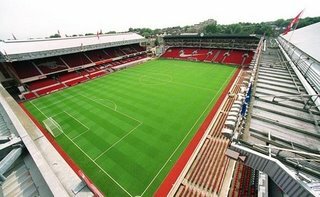 I got to thinking today (always dangerous): The pitch (field) at Highbury was the smallest in England and one of the smallest in Europe, measuring 110 yards long by 73 yards wide. In contrast, the size of the field at Emirates Stadium is much larger than at Highbury and is one of biggest fields in England and Europe. It measures 123.5 yards long and 83 yards wide. That is a pretty big difference: 13.5 yards longer and 10 yards wider; 10,250 square yards at Emirates compared to 8,030 square yards at Highbury. By my calculations that is a whopping 28% larger field. Will this affect Arsenal at all, be it positively or negatively? Their game is based on two things: pace and quick short passing. I would think that the bigger spaces would suit their style and strengths even more, as they would have more space to maneuver, although they will lose the advantage of familiarity in playing in a home field that is quirky. I'm thinking that they team with the most fitness and speed would benefit from a larger field size, and opposing teams that play 4-5-1 and try to clog the midfield to slow down the Arsenal attack will find it a bit more difficult on the significantly larger field. At the same time, I would think Arsenal will need to concentrate on keeping their shape but expanding their positioning vis a vis one another, and also adjusting some of their short passes to have a little more leg on them. It reminds me of the Boston Bruins, who played on the smallest ice surface in the NHL at the old Boston Gahden. It was actually smaller than the modern day NHL minimum, but got grandfathered in because the building was so old and could not accomodate anything larger. They were said to have an advantage because they were used to their little bandbox rink and visiting teams were often uncomfortable and cramped. When they moved to the Fleet Centah (or whatever they call it these days) the ice was regulation size and supposedly they lost that advantage. Tough to judge in their case because they have been pretty crappy for the last 10 years. Anyhow, I will be interested to see if the bigger pitch has any affect at all, as well as what they players have so say about it over the next few months. Thierry Henry is so incredibly dangerous when given space to operate, and especially in 1-on-1 situations in space; I would guess that he is licking his lips with anticipation to play on this field. I think the size that I quoted above is not neccessarily the size of the lined pitch but rather the size of the grass area. I got the number from the official Arsenal/Emirates site's key facts page, which says "Size of the grass area will be 113m by 76m. Compared to 105m by 70m at Highbury." I have spent a good half hour searching on line to try to confirm the actual dimensions of the playing field, and I cannot find any actual numbers, just a bunch of people commenting on how it is much bigger. I also remember Myles talking about how wide the pitch is and saying "it's the widest pitch in the premiership" when he went to the first public opening of the stadium on members day. If anybody finds the confirmed size of the actual playing field please let me know in the comments below. Thanks. I knew the new pitch was bigger than Highbury, but I had no idea it's that damn huge. I'm not sure if I've ever heard of any pitch that's bigger than that. Nou Camp and the Bernabeu are both about 115 x 78 yds, the San Siro is only 114 x 74 yds. Even the Maracana is only 120 x 82 (slightly smaller). That is freaking HUGE. I think Arsenal went from quirkly narrow to absurdly wide open. Don't know if it helps that much but hey, like you said, it should be weird to other teams coming in to play there. Yeah, it seems crazy that it is really that big. I wonder if the numbers that were given (123.5 x 83) is actually the size of the pitch or the size of the entire grassy area - I'll try to research & confirm. you might not have the same attempt to clog the midfield with 5, but i guarantee you, to accomodate for the size - longball, serious longball. basically with arsenal, i think we are going to see a lot of switches. short passing on one side; gets crowded; switch to the other side of the field; short passes. this will demand that teams play a more zonal defense against them, which will knock out most of the less talented teams. they will either play zones and get caught short by leaving lots of space, or man mark and get caught short when faster players smoke them. the only response for a lot of teams will be to camp a center forward just inside of the last defender and hoof it. odd continuity to it all. a cramped english stadium built to accomodate the new short passing game is replaced by a large "continental" stadium to accomodate a newer short passing game. either way, i am really, REALLY looking forward to watching them play in the new stadium. What is regulation? Is it like baseball where some things have to be regulation but the field doesn't?I ran into a "Canary?" supporter. (North of London) How jdo they fit into the overall mix? depending on league, age, etc. between 100-130 long by 50-100 wide. The "Canaries" are Norwich City. They currently play in what is now called teh Championship, which is confusing but in English means that it is the league just below the Premiership. They played in the Prem in 04-05 but got relegated.